As part of the Industry Invitational at this year’s Manhattan Cocktail Classic, I attended a seminar on Alcohol Health presented by Mercy. 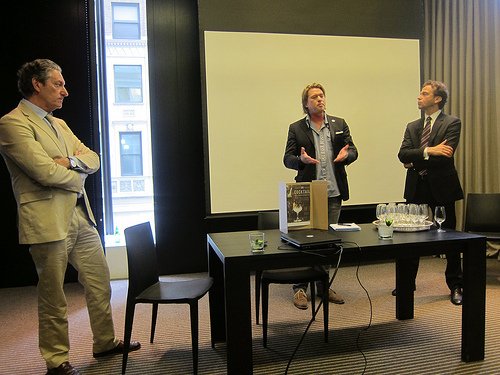 The talk was given by Doctors Steven Lamm, Richard Firshein and co-founder and bartender Alex Ott. First Dr. Lamm talked with us regarding what was known to be safe- one drink for women and two drinks for men a day. Given that some over indulge occasionally, the human body may not be able to process the alcohol (ethanol) quickly enough. The resulting hangover I learned is not really caused the booze itself but acetaldehyde, the chemical the body is producing to break down the alcohol. It is considered 30 times more toxic than alcohol itself. The headache, nausea and fatigue is caused by the acetaldehyde. Mercy claims its blend of amino acids, vitamins, antioxidants, electrolytes and herbal supplements will help you detox and won’t have a hangover. You would have to drink Mercy during or after your night out to be effective. It is not an energy drink and the doctors didn’t recommend trying to drink it in the morning– that would be too late. The side benefit is apparently Mercy would also rid you of the alcohol flush also known as the Asian glow for some of those affected by it. This is because Mercy helps break down acetaldehyde which some people can’t It was emphasized Mercy however does not rid you of intoxication. Essentially Mercy claims its drink will help your body produce more glutathione which neutralizes and removes free radicals and toxins. When you drink, you also lose the amino acid glutamine which when your body tries to produce more of it, it wakes you up. Mercy says if you drink their product, it helps retain the glutamine and so you’ll sleep more soundly. On their website, Mercy says their product works best chilled and recommends 1 full call for every 3-5 drinks. They don’t recommend more than 3 cans of Mercy per day (they said you should probably not have more than 9 drinks a day). One of the main ingredients of Mercy is milk thistle which is known to help with liver function. B vitamins are also helpful to the liver and Mercy includes Thiamin (B1), Niacin (B3), B6, B12 as well as vitamin C and folic acid (B9). For the complete list of ingredients, scroll down the page here. And then check out their FAQ why each ingredient helps combat hangovers. I tried my drink mixed with Mercy at the seminar and found it slightly watery and vaguely sweet. It tasted a bit like spa water- that is, water with cucumber. It was innocuous enough. I didn’t like the smell however. And I know they recommend for it to be drunk cold but I tasted a warm can on its own. It was not pleasant. The website says largely drinks have not been made with B1 because it doesn’t taste good. Mercy features it heavily though supposedly a version that is more pleasant. Still, I wonder what was the faintly chemical-y smell? For a good read on the history of fighting hangovers, check out the Modern Drunkard who apparently goes for the hair of the dog method of saline solution, oxygen and Bloody Bulls (Bloody Marys with beef bouillon). I am often asked what do I do. Well, I firmly believe in being well-hydrated and fed and I do actually drink (or try) to have water between drinks. I also know my limits. Overall I found the seminar a bit of a mixed bag, so to speak. It was good to learn the hows and whys of a hangover but I was a bit thrown off when Alex Ott spoke about bartenders probably unknowingly mixing potentially toxic drinks. He seemed to sneer a bit at the whole garden to glass movement. Yet then he said it was probably safer and more delicious to make your own drinks from ingredients from your fridge and/or spice rack. Granted, that was a bit in reference to pre-made syrups and flavored alcohols. Still, if trained mixologists shouldn’t be mixing cocktails without knowing how the ingredients interact with each other, how would you do any better as a home bartender? Also, one of the doctors said women tend to get drunk faster which I knew but then he said people who weigh more also do. This seems to be patently against logic considering how skinny people seem to get drunk faster. Still, everyone’s bodies are slightly different. Plus, it is known you can build your tolerance. Overall, it was a very interesting talk. It got people thinking about the effects of alcohol and how to prevent hangovers. This entry was posted in alcohol education, bar stories, bartenders, cocktail week, cocktails, history, spirits, the minty, travel and tagged alcohol education, alcohol health, andaz 5th avenue, education, hangover, health, industry invitational, manhattan, manhattan cocktail classic, mcc, mercy, ny, nyc, seminar, the minty, travel. Bookmark the permalink.